An optical material having a high birefringence and a small absolute value of a photoelastic coefficient is provided by a resin composition for an optical material comprising a resin (a) having a positive photoelastic coefficient and a negative inherent birefringence and a resin (b) having a negative photoelastic coefficient and a negative inherent birefringence. The present invention relates to an optical compensation film, a polarizer protective film and a polarizer having the same (hereinafter collectively referred to as the optical element of the present invention). More particularly, the present invention relates to an optical compensation film that utilizes its birefringence, and a molded article including the resin composition. In recent years, with the enlargement of a display market, a demand for the clearer image has risen. To meet the demand, instead of a simple transparent material, an optical material having advanced optical characteristics is required. One of such advanced optical characteristics is a birefringence. In general, a polymer has different indices of refraction in a molecular main chain direction and a direction perpendicular to the molecular main chain direction, and hence the birefringence is generated. In a certain use application, it is demanded to strictly control this birefringence. For example, for such a protective film as used on a polarizer of a liquid crystal, a molded article of a polymer material with a smaller birefringence and an even all-wavelength light transmittance is desired. A typical example of such a molded article is a film made of triacetyl cellulose. On the other hand, this birefringence can be utilized to change linear polarization to circular polarization (a 1/4 wavelength plate or the like), or to compensate the birefringence of the liquid crystal (an optical compensation film such as a retarder film). As such birefringent optical materials, polycarbonates are well known. In recent years, liquid crystal displays are getting larger, and accordingly polymer optical elements such as the retarder films need to get larger. However, when the optical element gets larger, bias of an external pressure is generated. Therefore, when the optical element is formed of a material whose birefringence easily changes by the external pressure, there is a problem that distribution of the birefringence occurs to make contrast on the display nonuniform. The easiness of the generation of the birefringence change by the external pressure is represented by a photoelastic coefficient. The above described polycarbonates have large photoelastic coefficients. Therefore, in replace of these polycarbonates, birefringent optical materials having small photoelastic coefficients are desired. As a retarder film comprising a styrene resin, a retarder film made of a styrene-acrylonitrile copolymer is known (Patent Document 1). However, this film has a large photoelastic coefficient, and hence it is not a satisfactory retarder film. A blend of the styrene-acrylonitrile copolymer and an acrylic resin (Non-Patent Document 1), a blend of a styrene-methacrylic acid copolymer and the acrylic resin (Patent Document 2), and a blend of a styrene-maleic anhydride copolymer and the acrylic resin (Non-Patent Document 2) are known. However, these blends are not intended to be used as optical materials. As a resin composition for the optical material comprising the styrene maleic anhydride copolymer, a resin composition consisting of the styrene-maleic anhydride copolymer and a polycarbonate is known (Patent Document 3). However, this resin composition is a combination of the resins having positive photoelastic coefficients, and hence an absolute value of the photoelastic coefficient of the composition is large. As an example where the positive and negative of the inherent birefringences are taken into consideration, a retarder film made of resins having the positive and the negative inherent birefringences (Patent Document 4) is also known. However, the film which is specifically disclosed in Patent Document 4 is a film consisting of a combination of resins having the positive photoelastic coefficients, and this kind of film has a large photoelastic coefficient. Moreover, a retarder film made of resins having positive and negative photoelastic coefficients is also known (Patent Document 5). In this retarder film, however, a resin having a large photoelastic coefficient (60 10.8 cm2 /N (= 60 X 10.2 Pa-1) or more) is used as the resin having the positive photoelastic coefficient to provide high birefringence necessary for the retarder film. Therefore, usable materials are limited, and there is a problem that the desired optical characteristics cannot freely be designed. Furthermore, it has nowadays been required that not only a in plane retardation of the retarder film but also a retardation in a thickness direction thereof is controllable in order to obtain a higher image quality of a liquid crystal screen. Thus, in a retarder film for a horizontal electric field (IPS) mode liquid crystal display which has attracted much attention in recent years, it is preferable that the retardation in the thickness direction is negative. However, the conventional optical film made of triacetyl cellulose or a polycarbonate, and the retarder film disclosed in Patent Document 5 has retardations in the thickness direction of positive. Therefore, there has been required an optical film having a small absolute value of the photoelastic coefficient and a negative retardation in the thickness direction. Non-Patent Document 2: D. Chopra, Society of Plastics Engineers. Annual Technical Conference, 59th, Vol. 2, p.2326-2330, 2001. An object of the present invention is to provide an optical compensation film having a high birefringence and a small birefringence change by an external pressure, that is, a small absolute value of a photoelastic coefficient. Furthermore, another object of the present invention is to provide an optical compensation film which exhibits a negative retardation in the thickness direction. The present inventors have found that, as a result of intensive investigation on the birefringence of a resin composition, a high birefringence can be imparted to the resin composition without comprising a resin having a large photoelastic coefficient by unifying either positive or negative inherent birefringence of main component resins. Furthermore, the present inventors have found that when the inherent birefringence of the main component resin is negative, the retardation in the thickness direction of a film of the resin composition can be negative. On the basis of the above-mentioned findings, the present inventors have found that a resin composition comprising a resin (a) having a positive photoelastic coefficient and a negative inherent birefringence and a resin (b) having a negative photoelastic coefficient and a negative inherent birefringence exhibits a high birefringence and a small absolute value of the photoelastic coefficient, and that a molded article of the resin composition has a negative retardation in the thickness direction. In consequence, the present invention has been completed. Thus, the present invention is as specified in the appended claims. The optical compensation film having a high birefringence and a small absolute value of a photoelastic coefficient can be prepared by using a resin composition for an optical compensation film of the present invention. Moreover, the value of the retardation of the optical compensation film can be controlled by molding and drawing this optical material under specific conditions. A resin composition for an optical material of the present invention comprise a resin (a) having a positive photoelastic coefficient and a negative inherent birefringence and a resin (b) having a negative photoelastic coefficient and a negative inherent birefringence. in which n1 is the index of refraction in the direction parallel to the stretching direction, and n2 is the index of refraction in the direction perpendicular to the stretching direction. The above formulas indicate that as the value of the photoelastic coefficient comes close to zero, the change in the birefringence induced by the external pressure is small, and this means that the birefringence preliminarily-designed for each application is not easily changed by the external pressure. in which npr is the index of refraction in the direction parallel to the orientation direction of an uniaxially-oriented polymer, and nvt is the index of refraction in the direction perpendicular to the orientation direction of the polymer. In the present invention, the resin having the negative inherent birefringence is a resin consisting of such a polymer that light incident to a uniaxially-oriented layer of the polymer displays a smaller index of refraction in the orientation direction than in a direction perpendicular to the orientation direction. The resin (a) will be described. The resin (a) in the present invention satisfies conditions that the photoelastic coefficient of the resin is positive and the inherent birefringence thereof is negative. The resin (a) is a styrene resin which is selected from the group consisting of a styrene-acrylonitrile copolymer having a content of acrylonitrile of from 1 to 40 % by mass, a styrene-methacrylic acid copolymer having a content of methacrylic acid of from 0.1 to 50 % by mass, and a styrene-maleic anhydride copolymer having a content of maleic anhydride of from 0.1 to 50 % by mass. In the present invention, the styrene resin is a polymer comprising at least a styrene monomer as a monomer component. 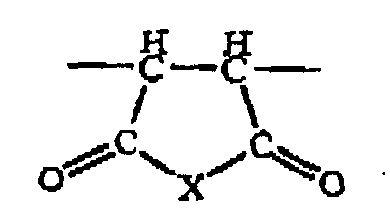 Here, the styrene monomer is a monomer having a styrene skeleton in a structure thereof. Specific examples of the styrene monomer include vinyl aromatic compound monomers, i.e., styrene; nuclear alkyl-substituted styrenes such as o-methyl styrene, m-methyl styrene, p-methyl styrene, 2,4-dimethyl styrene, ethyl styrene and p-tert-butyl styrene, and -alkyl-substituted styrenes such as -methyl styrene and -methyl-p-methyl styrene. A typical example is styrene. The styrene resin is a copolymer of the styrene monomer component and another monomer component. Examples of a copolymerizable monomer include alkyl methacrylates such as methyl methacrylate, cyclohexyl methacrylate, methyl phenyl methacrylate and isopropyl methacrylate; unsaturated carboxylic alkyl ester monomers of alkyl acrylates such as methyl acrylate, ethyl acrylate, butyl acrylate, 2-ethylhexyl acrylate and cyclohexyl acrylate; unsaturated carboxylic acid monomers such as methacrylic acid, and acrylic acid, itaconic acid, maleic acid, fumaric acid and cinnamic acid; unsaturated dicarboxylic acid anhydride monomers such as maleic anhydride and anhydrides of itaconic acid, ethyl maleic acid, methyl itaconic acid and chloromaleic acid; unsaturated nitrile monomers such as acrylonitrile and methacrylonitrile; and conjugated diene such as 1,3-butadiene, 2-methyl-1,3-butadiene(isoprene), 2,3-dimethyl-1,3-butadiene, 1,3-pentadiene and 1,3-hexadiene. Such comonomers can be used singly, or in combination of two or more thereof within the limits of the appended claims. As the resin (a), styrene-acrylonitrile copolymer, styrene-methacrylic acid copolymer and styrene-maleic anhydride copolymer are used, because properties such as heat resistance and transparency of these copolymers are suitable for the optical material. Moreover, the styrene-acrylonitrile copolymer, the styrene-methacrylic acid copolymer and the styrene-maleic anhydride copolymer exhibit good miscibility with a polymer comprising methyl methacrylate as a monomer component, and hence these copolymers are especially preferable when the polymer comprising methyl methacrylate as a monomer component is used as the resin (b). In the styrene-acrylonitrile copolymer, a content of acrylonitrile in the copolymer is 1 to 40 % by mass. A further preferable range is 1 to 30 % by mass, and an especially preferable range is 1 to 25%. The styrene-acrylonitrile copolymer with the content of acrylonitrile of 1 to 40 % by mass is preferable because such a copolymer exhibits excellent transparency. In styrene-methacrylic acid copolymer, a content of methacrylic acid in the copolymer is 0.1 to 50 % by mass. A more preferable range is 0.1 to 40 % by mass, and a further preferable range is 0.1 to 30 % by mass. The styrene-methacrylio acid copolymer with the content of methacrylic acid of 0.1 % by mass or more is used because such a copolymer exhibits excellent heat resistance. In addition, the styrene-methacrylic acid copolymer with the content of methacrylic acid of 50 % by mass or less is used because such a copolymer exhibits excellent transparency. In styrene-maleic anhydride copolymer, a content of maleic anhydride in the copolymer is 0.1 to 50 % by mass. A more preferable range is 0.1 to 40 % by mass, and a further preferable range is 0.1 % by mass to 30 % by mass. The styrene-maleic anhydride copolymer with the content of maleic anhydride in the copolymer of 0.1 % by mass or more is used because such a copolymer is excellent in heat resistance. In addition, the styrene-maleic anhydride copolymer with the content of maleic anhydride of 50 % by mass or less is used because such a copolymer exhibits excellent transparency. Among these copolymers, the styrene-methacrylic acid copolymer and the styrene-maleic anhydride copolymer are especially preferable from a viewpoint of heat resistance. As the resin (a), different types of styrene resins having different compositions or molecular weights may be used in combination. The styrene resin can be obtained by a known method including anion, bulk, suspension, emulsion or solution polymerization method. In the styrene resin, unsaturated double bonds of a conjugated diene or a benzene ring of the styrene monomer may be hydrogenated. A hydrogenation ratio can be measured by a nuclear magnetic resonance apparatus (NMR). The photoelastic coefficient of the resin (a) in undrawn state is preferably 60 × 10-12 Pa-1 or less, further preferably 30 × 10-12 Pa-1 or less, especially preferably 6 × 10-12 Pa-1 or less. When the photoelastic coefficient of the resin (a) is within this range, an optical film having a small photoelastic coefficient and desired Rth can be obtained. The resin (b) will be described. As the resin (b) in the present invention, an acrylic resin is used wherein the resin satisfies conditions that the photoelastic coefficient of the resin is negative and the inherent birefringence thereof is negative. In the present invention, the acrylic resin is a polymer comprising acrylic acid, methacrylic acid or a derivative thereof as a monomer component. Among these acrylic resins, a polymer comprising an alkyl ester of acrylic acid or an alkyl ester of methacrylic acid as the monomer component is especially preferable when the styrene resin is used as the resin (a), because the above polymer exhibits good miscibility with the styrene resin. A specific example of the acrylic resin comprising the alkyl ester of acrylic acid or the alkyl ester of methacrylic acid as the monomer component includes a polymer of one or more monomers selected from the group consisting of alkyl esters of methacrylic acid such as cyclohexyl methacrylate, t-butylcyclohexyl methacrylate and methyl methacrylate; and alkyl esters of acrylic acid such as methyl acrylate, ethyl acrylate, butyl acrylate, isopropyl acrylate and 2-ethylhexyl acrylate. Moreover, examples of the acrylic resin comprising the alkyl ester of acrylic acid or the alkyl ester of methacrylic acid as the monomer component also include copolymers which also comprise monomer other than the alkyl ester of methacrylic acid and the alkyl ester of acrylic acid. Examples of monomers copolymerizable with the alkyl ester of acrylic acid and the alkyl ester of methacrylic acid other than the alkyl ester of methacrylic acid and the alkyl ester of acrylic acid include aromatic vinyl compounds such as styrene, vinyl toluene and -methyl styrene; vinyl cyanides such as acrylonitrile and methacrylonitrile; maleimides such as N-phenyl maleimide and N-cyclohexyl maleimide; unsaturated carboxylic anhydrides such as maleic anhydride; and unsaturated acids such as acrylic acid, methacrylic acid and maleic acid. They can be used singly or in combination of two or more thereof. When the monomer component other than the alkyl ester of methacrylic acid and the alkyl ester of acrylic acid is comprised, a copolymerization ratio of the monomer component is preferably less than 50 % by mass with respect to the alkyl ester of methacrylic acid or the alkyl ester of acrylic acid. The ratio is further preferably 40 % by mass or less, especially preferably 30 % by mass or less. The copolymer with the copolymerization ratio of less than 50 % by mass exhibits an excellent optical characteristic such as all-wavelength light transmittance. Among the polymers comprising the alkyl ester of acrylic acid or the alkyl ester of methacrylic acid as the monomer component, a homopolymer of methyl methacrylate and a copolymer of methyl methacrylate and another monomer are preferable, because properties such as heat resistance and transparency of them are suitable for the optical material. As monomers to be copolymerized with methyl methacrylate, the alkyl esters of acrylic acid are especially preferable, because they have excellent thermal decomposition resistance and methacrylic resins obtained by their copolymerization have high fluidity during molding. An amount of alkyl ester of acrylic acid when methyl methacrylate is copolymerized with the alkyl ester of acrylic acid is preferably 0.1 % by mass or more from a viewpoint of the thermal decomposition resistance, and preferably 15 % by mass or less from a viewpoint of heat resistance. The amount is further preferably 0.2 % by mass or more and 14 % by mass or less, especially preferably 1 % by mass or more and 12 % by mass or less. Among alkyl esters of acrylic acid, methyl acrylate and ethyl acrylate are preferable, because even when they are copolymerized in a small amount with methyl methacrylate, an effect of improving the fluidity during the molding is remarkably achieved. A mass-average molecular weight of the acrylic resin is preferably 50,000 to 200,000. The mass-average molecular weight is preferably 50,000 or more from a viewpoint of strength of a molded product, and preferably 200,000 or less from viewpoints of molding properties and the fluidity. A further preferable range is 70,000 to 150,000. Moreover, in the present invention, an isotactic polymethacrylate ester and a syndiotactic polymethacrylate ester can simultaneously be used. As a method for manufacturing the acrylic resin, any conventional polymerization method such as cast polymerization, bulk polymerization, suspension polymerization, solution polymerization, emulsion polymerization or anion polymerization can be employed. For optical use applications, it is preferable to avoid contamination with micro foreign materials as much as possible, and from this viewpoint, the bulk polymerization and the solution polymerization in which any suspending medium or emulsifier is not used are preferable. When the solution polymerization is carried out, a solution of a mixture of monomers dissolved in a solvent of an aromatic hydrocarbon such as toluene or ethyl benzene can be used. When bulk polymerization is carried out, the polymerization can be started with free radicals generated by heating or ionizing radiation irradiation. As an initiator for a polymerizing reaction, any initiator for the radical polymerization can be used. For example, an azo compound such as azobisisobutyl nitrile, or organic peroxide such as benzoyl peroxide, lauroyl peroxide or t-butylperoxy-2-ethyl hexanoate can be used. In particular, when the polymerization is carried out at a high temperature of 90 deg. C or more, the solution polymerization is generally employed. Therefore, a preferred initiator includes a peroxide, and an azobis initiator or the like, which have a half-life period temperature for10 hours of 80 deg. C or more and which are soluble in an organic solvent used. Examples of the initiator include 1,1-bis(t-butylperoxy)-3,3,5-trimethylcyclohexane, cyclohexane peroxide, 2,5-dimethyl-2,5-di(benzoylperoxy)hexane, 1,1-azobis(1-cyclohexane carbonitrile), and 2-(carbamoylazo)isobutylonitrile. Such an initiator is preferably used within a range of, for example, 0.005 to 5 % by mass. As a molecular weight adjustment agent which is optionally used in the polymerizing reaction, any agent can be used. Especially preferred molecular weight adjustment agent includes mercaptan compounds such as butyl mercaptan, octyl mercaptan, dodecyl mercaptan and 2-ethylhexyl thioglycollate. The molecular weight adjustment agent is added at such a concentration that the polymerization degree of the acrylic resin is controlled within a preferable range. As the resin (b), a methyl methacrylate homopolymer, a methyl methacrylate-methyl acrylate copolymer, or a methyl methacrylate-ethyl acrylate copolymer is preferable, and above all, the methyl methacrylate-methyl acrylate copolymer is preferable in that the copolymer achieves a good balance between fluidity during molding and heat resistance. As the resin (b), different types of acrylic resins having different compositions or molecular weights can be used in combination. The photoelastic coefficient of the resin (b) in undrawn state is preferably -60 × 10-12 Pa-1 or more, further preferably -30× 10-12 Pa-1 or more, especially preferably -6× 10-12 Pa-1 or more. When the photoelastic coefficient of the resin (b) is within this range, an optical film having a small photoelastic coefficient and a desired Rth can be obtained. Next, a resin composition for the optical compensation film according to the present invention will be described. It is preferable that the resins (a) and (b) are miscible with each other. The miscibility can be achieved by appropriately selecting compositions of the resins (a), (b) (including a copolymer composition), a blend ratio, a kneading temperature, a kneading pressure, a cooling temperature, a cooling rate and the like. The miscibility is described in detail in " High-Performance Polymer Alloy" (edited by the Society of Polymer Science, Japan, issued in 1991 by Maruzen Co., Ltd.). When the resins (a) and (b) are miscible with each other, the all-wavelength light transmittance of the molded article of the resin composition comprising the resins (a) and (b) can be increased. From such a viewpoint, the present invention includes to combine the styrene resin as the resin (a) with the acrylic resin as the resin (b). By selecting the resins (a) and (b) in this combination, it is possible to manufacture an optical element having high stability free from deterioration of transparency caused by phase separation during use. In the resin composition for the optical compensation film of the present invention, the photoelastic coefficient of the composition can be controlled by adjusting contents of the resins (a) and (b) and a mass ratio between the resins (a) and (b) . A content of the resin (a) in the resin composition for the optical compensation film of the present invention is preferably 0.1 to 99.9 parts by mass, more preferably 0.2 to 90 parts by mass, especially preferably 20 to 80 parts by mass. A content of the resin (b) is preferably 0.1 to 99.9 parts by mass, more preferably 10 to 99.8 parts by mass, especially preferably 20 to 80 parts by mass. Moreover, a total of the contents of the resins (a) and (b) is preferably 70 % by mass or more with respect to the resin composition, further preferably 80 % by mass or more, especially preferably 90 % by mass or more. Furthermore, a preferred mass ratio between the resins (a) and (b) ((a)/(b)) depends upon kinds of the resins (a) and (b), but it is preferably 0.1/99.9 to 99.9/0.1, further preferably 20/80 to 80/20, especially preferably 40/60 to 60/40. The resin composition for the optical compensation film of the present invention preferably comprise ultraviolet absorbent (c) of 0.1 to 10 parts by mass, further preferably 0.1 to 2 parts by mass, especially preferably 0.1 to 1.5 parts by mass or less with respect to 100 parts by mass of the total of the resins (a) and (b). By adding an ultraviolet absorbent (c) in that amount, the photoelastic coefficient and the spectral transmittance can be controlled within preferable ranges. However, when an excess amount of ultraviolet absorbent (c) is added, the photoelastic coefficient increases, which is not preferable for the optical material. The content of the ultraviolet absorbent (c) can be determined based on the ratio of integral values of peak signal areas of proton NMR obtained by a nuclear magnetic resonance apparatus (NMR), or it can be determined by gas chromatography (GC) after extracting the ultraviolet absorbent (c) from the resin by using a good solvent. Examples of the ultraviolet absorbent (c) include a benzotriazole compound, a triazine compound, a benzoate compound, a benzophenone compound, an oxybenzophenone compound, a phenol compound, an oxazole compound, a malonate ester compound, a cyanoacrylate compound, a lactone compound, a salicylate ester compound, and a benzoxazinone compound. The benzotriazole compound and a benzotriazine compound are preferable. They may be used singly or in a combination of two or more thereof. Preferred vapor pressure (P) of the ultraviolet absorbent (c) at 20 deg. C is 1.0 × 10-4 Pa or less, in order to achieve excellent molding properties. The vapor pressure (P) is further preferably 1.0 × 10-6 Pa or less, especially preferably 1.0 × 10-8 Pa or less. Here, excellent molding property means, for example, that the adhesion of a low molecular compound to a roll during film molding is reduced. When the low molecular compound adheres to the roll, the compound also adheres to the surface of the molded article, and an appearance and an optical characteristic of the molded article are deteriorated. Such molded article is not suitable for the optical material. Preferred melting point (Tm) of the ultraviolet absorbent (c) is 80 deg. C or more, in order to achieve excellent molding properties. The melting point (Tm) is further preferably 130 deg. C or more, and the melting point (Tm) is especially preferably 160 deg. C or more. Moreover, the mass decrease ratio of the ultraviolet absorbent (c) in heating from 23 deg. C to 260 deg. C at a rate of 20 deg. C/min is preferably 50% or less, in order to achieve excellent molding properties. The mass decrease ratio is more preferably within the range of 15% or less, and especially preferably 2% or less. The resin composition to be used in the present invention can comprise a polymer other than the resin (a) and (b) components in such an amount that the object of the present invention is not impaired. Examples of the polymer other than the resins (a) and (b) include rubber components such as olefin elastomer, styrene elastomer and acrylic rubber; thermoplastic resins, for example, polyolefin such as polyethylene and polypropylene, polyamide, polyphenylene sulfide resin, polyether ether ketone resin, polyester, polysulfone, polyphenylene oxide, polyimide, polyether imide, and polyacetal; and thermosetting resins such as a phenol resin, a melamine resin, a silicone resin and an epoxy resin. A content of the polymer other than the resins (a) and (b) is preferably 30 % by mass or less with respect to the resin composition. Furthermore, any additive can be blended with the resin composition to be used in the present invention in accordance with a purpose in any amount that will not remarkably impair any effect of the present invention. There is no special limitation on such an additive as long as the additive is conventionally blended with a resin or a rubber-like polymer. Examples of the additive include an inorganic filler; a pigment such as iron oxide; lubricants such as stearic acid, behenic acid, zinc stearate, calcium stearate, magnesium stearate, and ethylene bisstearoamide; a mold release agent; softeners/plasticizers such as paraffin process oil, naphthene process oil, aromatic process oil, paraffin, organic polysiloxane, and mineral oil; antioxidants such as a hindered phenol antioxidant and a phosphoric heat stabilizer; ultraviolet absorbents such as a hindered amine light stabilizer, a benzotriazole ultraviolet absorbent and a benzophenone ultraviolet absorbent; a flame retardant; an antistatic agent; reinforcing agents such as an organic fiber, a glass fiber, a carbon fiber and a metal whisker; a colorant and the like. There is no special limitation on a manufacturing method of a resin composition for the optical compensation film of the present invention, and a known method can be employed. The resins (a) and (b) and, if necessary, the other components can melted and kneaded to manufacture the resin composition by use of a uniaxial extruder, a biaxial extruder, Banbury mixer, Brabender or a melting kneader such as any type of kneader. Next, the optical compensation film obtained using the resin composition for use in the present invention will be described. There is no special limitation on a molding method, and a known method can be employed. Molding can be carried out by a method such as injection molding, sheet molding, blow molding, injection blow molding, inflation molding, extrusion molding or foam molding, and a secondary processing molding process such as pneumatic molding or vacuum molding may be used. In the present invention, a configuration of the molded article for the optical element can be a film or a sheet. In the present invention, a film is a body with a thickness of 300 m or less, and a sheet is a body with a thickness of 300 m or more. Moreover, in the present invention, the thickness of the film is preferably 1 m or more, more preferably 5 µm or more. The thickness of the sheet is preferably 10 mm or less, more preferably 5 mm or less. When the molded article for the optical element of the present invention is a film or sheet, it is preferable that the article is molded by a technique such as extrusion molding or cast molding. An undrawn film or sheet can be prepared by extrusion molding with an extruder to which a T-die, a circular die or the like is attached. When a molded article is prepared by the extrusion molding, the resins (a) and (b) can be melted and kneaded in advance, or can be melted and kneaded during extrusion molding. The resins (a) and (b) can also be dissolved in a common solvent for the resins (a) and (b), for example, chloroform or methylene dichloride, then cast, dried and cured to prepare undrawn film by cast molding. Furthermore, the undrawn film or sheet may optionally be uniaxially drawn in a mechanical flow direction or in a direction perpendicular to the mechanical flow direction. The film or sheet may also be biaxially drawn by a biaxial drawing process such as sequential biaxial drawing by roll drawing and tenter drawing, simultaneous biaxial drawing by tenter drawing, or biaxial drawing by tubular drawing, to manufacture the biaxially drawn film or sheet. Drawing is preferably performed under a temperature of (Tg-20 deg. C) to (Tg+50 deg. C) on the basis of a glass transition temperature (Tg). Moreover, the draw ratio is preferably 0.1 to 1000% in either direction, more preferably 0.2 to 600%, and especially preferably 0.3 to 300%. A molded article for the optical element with a draw ratio within this range exhibits an excellent birefringence, heat resistance and strength. By biaxially drawing a film with different draw ratio in the mechanical flow direction and the direction perpendicular to the mechanical flow direction, a film with a high strength and a high in-plane retardation is obtained. Such a film having a small photoelastic coefficient and a high retardation is preferably used as a retarder film. On the other hand, by biaxially drawing a film with a substantially equal draw ratio in the mechanical flow direction and the direction perpendicular to the mechanical flow direction, a film with a high strength and a low in-plane retardation is obtained. Such a film having a small photoelastic coefficient and a low retardation is preferably used as a polarizer protective film. The optical compensation film of the present invention can be used by laminating two or more of the same with different properties such as retardation, or by laminating on a polymer film other than the film of the present invention. It is preferable that the optical compensation film of the present invention has a photoelastic coefficient absolute value of 0 to 5 × 10-12 Pa-1. The absolute value of the photoelastic coefficient is more preferably 0 to 4 × 10-12 Pa-1, further preferably 0 to 3.5 × 10-12 Pa-1, especially preferably 0 to 3.0 × 10-12 Pa-1 or less. When the photoelastic coefficient of the optical compensation film is within this range, the birefringence change induced by an external pressure is small. Therefore, when the molded article is used with a large-sized liquid crystal display device or the like, an image with excellent contrast and screen uniformity is provided. wherein nx: the main index of refraction in the x-direction when the x-direction is defined as a direction in a plane of a molded article, the index of refraction in which is maximum, ny: a main index of refraction in y-direction which is perpendicular to x-direction in the molded article plane, nz; a main index of refraction in the thickness direction of the molded article, and d: a thickness (nm) of the molded article. Re for the optical compensation film of the present invention is preferably 0 to 400 nm, more preferably 5 to 350 nm, and especially preferably in excess of 20 nm and 350 nm or less. When the optical compensation film of the present invention is used as a 1/4 wavelength plate, the absolute value of Re is preferably 100 nm or more and 180 nm or less, further preferably 120 nm or more and 160 nm or less, further preferably 130 nm or more and 150 nm or less. When the optical compensation film of the present invention is used as 1/2 wavelength plate, the absolute value of Re is preferably 240 nm or more and 320 nm or less, further preferably 260 nm or more and 300 nm or less, further preferably 270 nm or more and 290 nm or less. An absolute value of Re/Rth of the optical compensation film of the present invention is preferably 3 or less, more preferably 0.1 to 2, further preferably 0.2 to 1.5. The absolute value of Re/Rth can be controlled by adjusting the draw ratio in the MD, TD directions, film thickness, and mass ratio between the resins (a) and (b). In the present invention, Rth of the optical compensation film is designed to be negative value. A film with a Rth of negative value is suitable for an optical compensation film for a liquid crystal display. In particular, the film is suitable for a horizontal electric field (IPS) mode liquid crystal display. Rth is -350 nm to -5 nm, preferably -300 nm to -10 nm. The value of Rth can be controlled by adjusting the draw ratio in the MD, TD directions, the film thickness, and the mass ratio between the resins (a) and (b). The Nz coefficient of the optical compensation film of the present invention is preferably -5 to 0, more preferably -3 to 0, especially preferably -1.5 to 0. A film with the coefficient of within this range is suitable for a compensation film for the liquid crystal display. In particular, the film is suitable for the horizontal electric field (IPS) mode liquid crystal display. The Nz coefficient can be controlled by adjusting draw ratio in the MD, TD directions, film thickness, and mass ratio between the resins (a) and (b). The all-wavelength light transmittance of the optical compensation film of the present invention is preferably 80% or more, more preferably 85% or more, further preferably 87% or more, especially preferably 90% or more. Such all-wavelength light transmittance can be achieved by achieving a good miscibility of components of the resin composition for the optical material by adjusting the compositions (including a copolymerization composition), blend ratio, kneading temperature, kneading pressure, cooling temperature, cooling rate and the like of the resins (a), (b). The spectral transmittance in 380 nm of the optical compensation film of the present invention is preferably 5% or less. A film with a lower spectral transmittance in an ultraviolet region of 380 nm is suitable for an optical film since it can prevent deterioration of a polarizer or a liquid crystal element. The spectral transmittance in 380 nm is further preferably 3% or less, and the spectral transmittance in 380 nm is especially preferably 2.5% or less. Consequently, in the optical compensation film of the present invention, the spectral transmittance in 380 nm is preferably 5% or less, and the absolute value of the photoelastic coefficient is preferably 0 to 4 × 10-12 Pa-1. In this case, the absolute value of the photoelastic coefficient is further preferably 0 to 3.5 × 10-12 Pa-1, especially preferably 0 to 3.0 × 10-12 Pa-1. The optical compensation film of the present invention can be subjected to a surface functionalization treatment such as a antireflection treatment, a transparency conductive treatment, an electromagnetic wave shielding treatment or a gas barrier treatment, and can preferably be used as a surface functionalized base material. The optical compensation film of the resin composition of the present invention has a high mechanical strength, and can therefore be used as a protective film for any type of optical element. In particular, it is possible to induce an optical anisotropy in the optical compensation film of the resin composition of the present invention, and therefore it is preferably used as the polarizer protective film. A case where the optical compensation film of the present invention is used as the polarizer protective film will hereinafter be described. The polarizer protective film of the present invention can be laminated on a polarization film to manufacture a polarizer. In the present invention, it is preferable to laminate a protective film having Re of 10 nm or more on one surface of the polarization film and to laminate a protective film having Re of 10 nm or less on the other surface of the film. A film with optical isotropy such as triacetyl cellulose is conventionally used for the protective film, as it is used for the protection of a polarization film. In contrast, in a preferable embodiment of the present invention, a protective film with optical anisotropy is laminated on one surface of the polarization film, and a protective film with optical isotropy is laminated on the other surface of the film. In consequence, the protective film on one surface also serves as an optical anisotropic film, so that an optical anisotropic film such as retarder film made of a polycarbonate resin or a cycloolefin resin conventionally laminated on the protective film of the polarizer can be omitted and reduced thickness of the polarizer can be achieved. Moreover, a step of laminating another optical anisotropic film onto the protective film does not need to be carried out, hence leading to better productivity. Furthermore, Re of the protective film to be laminated on one surface of the polarization film is preferably 10 nm or more, more preferably 20 to 1000 nm, further preferably 30 to 900 nm. The protective film to be laminated on one surface with Re of 10 nm or more also has a function of an optical compensation retarder film, 1/4 wavelength plate, 1/2 wavelength plate or another retarder film. Moreover, it is preferable that Re of the protective film to be laminated on the other surface of the polarization film with optical isotropy is preferably small, and Re is preferably 10 nm or less, more preferably 8 nm or less, further preferably 5 nm or less. In the present invention, it is preferable to use a film made of an acrylic resin (d) as the protective film to be laminated on the other surface with optical isotropy. Specific examples of the acrylic resin (d) are preferably obtained by polymerizing a monomer of one or more selected from the group consisting of alkyl ester of methacrylic acids such as cyclohexyl methacrylate, t-butyl cyclohexyl methacrylate and methyl methacrylate, and alkyl ester of acrylic acids such as methyl acrylate, ethyl acrylate, butyl acrylate, isopropyl acrylate and 2-ethylhexyl acrylate. Among them, a homopolymer of methyl methacrylate or a copolymer of methyl methacrylate and another monomer is especially preferable. Examples of a monomer copolymerizable with methyl methacrylate include aromatic vinyl compounds such as another alkyl ester of methacrylic acid, alkyl ester of acrylic acid, styrene, vinyl toluene and -methyl styrene; vinyl cyanides such as acrylonitrile and methacrylonitrile; maleimides such as N-phenyl maleimide and N-cyclohexyl maleimide; unsaturated carboxylic anhydrides such as maleic anhydride; and unsaturated acids such as acrylic acid, methacrylic acid and maleic acid. They can be used singly or as a combination of two or more of them. Among these monomers copolymerizable with methyl methacrylate, the alkyl ester of acrylic acid is particularly preferable because it has an excellent thermal decomposition resistance, and a resin methacrylate obtained by the copolymerization of this monomer exhibits a high fluidity during molding. An amount of the alkyl ester of acrylic acid for use in a case where methyl methacrylate is copolymerized with the alkyl ester of acrylic acid is preferably 0.1 % by mass or more from a viewpoint of the thermal decomposition resistance, and preferably 15 % by mass or less from a viewpoint of the heat resistance. The amount is further preferably 0.2 to 14 % by mass, especially preferably 1 to 12 % by mass. As the alkyl ester of acrylic acid, methyl acrylate and ethyl acrylate are preferable, because even when they are copolymerized of with methyl methacrylate in a small amount, the fluidity during molding is remarkably improved. It is preferable that a mass-average molecular weight of the acrylic resin (d) is 50,000 to 200,000. The mass-average molecular weight is preferably 50,000 or more from a viewpoint of strength of the molded article, and preferably 200,000 or less from the viewpoints of the molding processability and the fluidity. A further preferable range is 70,000 to 150,000. Moreover, in the present invention, an isotactic polymethacrylate ester and a syndiotactic polymethacrylate ester can simultaneously be used. As a method for manufacturing the acrylic resin (d), any conventional polymerization method such as cast polymerization, bulk polymerization, suspension polymerization, solution polymerization, emulsion polymerization or anion polymerization can be employed. For an optical use application, it is preferable to avoid contamination with micro foreign materials as much as possible, and from this viewpoint, the bulk polymerization and the solution polymerization in which any suspending medium or emulsifier is not used are preferable. Specifically, a method disclosed in Japanese Patent Application Publication No. 63-1964 can be used. When the solution polymerization is carried out, a solution of a mixture of monomers dissolved in a solvent of an aromatic hydrocarbon such as toluene or ethyl benzene can be used. When the bulk polymerization is carried out, the polymerization can be started with free radicals generated by heating or ionizing radiation irradiation in a conventional manner. As an initiator for a polymerizing reaction, any initiator for the radical polymerization can be used. For example, an azo compound such as azobisisobutyl nitrile, or an organic peroxide such as benzoyl peroxide, lauroyl peroxide or t-butylperoxy-2-ethyl hexanoate can be used. In particular, when the polymerization is carried out at a high temperature of 90 deg. C or more, the solution polymerization is generally employed. Therefore, a preferred initiator is a peroxide, an azobis initiator or the like which has a half-life period temperature for 10 hours of 80 deg. C or more and which is soluble in an organic solvent used. Examples of the initiator include 1, 1-bis(t-butylperoxy)-3,3,5-trimethylcydohexane, cyclohexane peroxide, 2,5-dimethyl-2,5-di(benzoylperoxy)hexane, 1,1-azobis(1-cyclohexane carbonitrile), and 2-(carbamoylazo)isobutylonitrile. It is preferable that such an initiator is used within a range of, for example, 0.005 to 5 % by mass. As a molecular weight adjustment agent which is optionally used in the polymerizing reaction, any agent can be used. Especially preferred examples of the molecular weight adjustment agent include mercaptan compounds such as butyl mercaptan, octyl mercaptan, dodecyl mercaptan and 2-ethylhexyl thioglycollate. The molecular weight adjustment agent is added at such a concentration that a polymerization degree of the acrylic resin (d) is controlled within a preferable range. As the acrylic resin (d) in the present invention, a copolymer obtained by copolymerizing ester methacrylate and/or ester acrylate, the aromatic vinyl compound and a compound represented by the following formula  is preferable. wherein X is O or N-R, O is an oxygen atom, N is a nitrogen atom, and R is a hydrogen atom or an alkyl group. As ester methacrylate and/or ester acrylate to be copolymerized with the compound represented by the formula , methyl methacrylate is preferable. Examples of the aromatic vinyl compound include -alkyl substituent styrene such as -methyl styrene and a-methyl-p-methyl styrene, and styrene is preferable. As the compound represented by the above formula , X = O is preferable, that is, maleic anhydride is preferable. Furthermore, from the viewpoints of the heat resistance and the photoelastic coefficient, it is preferable that a methyl methacrylate unit in the copolymer is 40 to 90 % by mass, a styrene unit is 5 to 40 % by mass, and a maleic acid unit is 5 to 20 % by mass, and a ratio of the styrene unit with respect to the maleic acid unit is one to three times. The methyl methacrylate unit in the copolymer is further preferably 40 to 90 % by mass, the maleic anhydride unit is 5 to 19 % by mass and the styrene unit is 10 to 40 % by mass, and the methyl methacrylate unit in the copolymer is especially preferably 45 to 88 % by mass, the maleic anhydride unit is 6 to 15 % by mass and the styrene unit is 16 to 40 % by mass. From the viewpoint of the strength of the molded article, it is preferable that a melt index (ADTM D1238; I condition) of the acrylic resin (d) for use in the present invention is 10 g/10 minutes or less. The index is more preferably 6 g/10 minutes or less, more preferably 3 g/10 minutes or less. The acrylic resin (d) may include a fatty polyester resin (e). Examples of the fatty polyester resin (e) include a polymer comprising fatty hydroxycarboxylic acid as a main constituting component, and a polymer comprising fatty polycarboxylic acid and fatty polyhydric alcohol as main constituting components. Examples of the polymer comprising fatty hydroxycarboxylic acid as the main constituting component include poly-glycolic acid, poly lactic acid, poly 3-hydroxybutyric acid, poly 4-hydroxybutyric acid, poly 4-hydroxyvaleric acid, poly 3-hydroxyhexanoic acid, and poly caproic lactone, and examples of the polymer comprising fatty polycarboxylic acid and fatty polyhydric alcohol as the main constituting components include polyethylene adipate, polyethylene succinate, polybutylene adipate, and polybutylene succinate. The fatty polyester resin (e) may be used singly or in combination of two or more thereof. Among these fatty polyester resins (e), the polymer comprising hydroxycarboxylic acid as the main constituting component is preferable, and a polylactic resin is especially preferably used. One or more of these (e) components may be used. Examples of the polylactic resin include a polymer comprising L-lactic acid and/or D-lactic acid as the main constituting component. In the polylactic resin, regarding a molar ratio between an L-lactic acid unit and a D-lactic acid unit, the polymer comprise preferably 85% or more, more preferably 90% or more, further preferably 94% or more of either an L-article or a D-article with respect to a total of 100% of the L-article and the D-article. In the present invention, poly L-lactic acid mainly composed of the L-lactic acid and poly D-lactic acid mainly composed of the D-lactic acid may be used in combination. The polylactic resin include a comonomer copolymerized with a lactic derivative monomer other than the L-article and the D-article, or another component copolymerizable with lactide, and examples of such a component include dicarboxylic acid, polyhydric alcohol, hydroxycarboxylic acid, and lactone. The polylactic resin may be polymerized by a known polymerization process such as direct dehydration condensation or ring opening polymerization of lactide. If necessary, the resin may highly molecularly be polymerized using a bonding agent such as polyisocyanate. A preferable mass-average molecular weight of the polylactic resin is preferably 30,000 or more from a viewpoint of mechanical properties, more preferably 1000,000 or less from a viewpoint of processing properties. The mass average molecular weight is further preferably 50,000 to 500,000, most preferably 100,000 to 280,000. Moreover, the polylactic resin may comprise 1 to 30 % by mass of a copolymer component other than lactic acid in such a amount that the object of the present invention is not impaired. Examples such another copolymer component unit include polycarboxylic acid, polyhydric alcohol, hydroxycarboxylic acid, and lactone. Examples of the component include polycarboxylic acids such as oxalic acid, succinic acid, glutaric acid, adipic acid, azelaic acid, sebacic acid, dodecandionic acid, fumaric acid, cyclohexane carboxylic acid, terephthalic acid, isophthalic acid, phthalic acid, 2,6-naphthalen dicarboxylic acid, 5-sodium sulfoisophthalic acid, and 5-tetrabutyl phosphonium sulfoisophthalic acid; polyhydric alcohols such as ethylene glycol, propylene glycol, butane diol, heptane diol, hexane diol, octane diol, nonane diol, decane diol, 1,4-cyclohexane dimethanol, neopentyl glycol, glycerin, trimethylol propane, pentaerythritol, bisphenol A, aromatic multivalent alcohol obtained by an additional reaction of bisphenol with ethylene oxide, diethylene glycol, triethylene glycol, polyethylene glycol, polypropylene glycol, and polytetramethylene glycol; hydroxycarboxylic acids such as glycolic acid, 3-hydroxybutyric acid, 4-hydroxybutyric acid, 4-hydroxyvaleric acid, 6-hydroxy caproicacid, and hydroxylbenzoic acid; and lactones such as glycolide, -caprolactone glycolide, -caprolactone, -propiolactone, -butyrolactone, - or -butyrolactone, pivarolactone, and -valerolactone. These copolymer components may be used singly or in combination of two or more thereof. As a manufacturing method of the fatty polyester resin (e), a known polymerization method may be used, and especially with regard to the polylactic resin, a direct polymerization process from lactic acid, a ring opening polymerization process via lactide or the like can be employed. In the present invention, amount (parts by mass) of acrylic resin (d) in the resin composition constituted of the acrylic resin (d) and the fatty polyester resin (e) is preferably 0.1 to 99.9 parts by mass, further preferably 50 to 99.9 parts by mass, especially preferably 60 to 95 parts by mass with respect to a total of 100 parts by mass of the acrylic resin (d) and the fatty polyester resin (e) from viewpoints of the photoelastic coefficient, strength, heat resistance and Hayes value. The amount is preferably 50 parts by mass or more, as the Hayes value under humidity and heat of the material decreases. An optical material with a small Hayes value or a small Hayes change can preferably be used for a display application or the like. The amount (parts by mass) of the fatty polyester resin (e) is preferably 0.1 to 99.9 parts by mass, further preferably 0.1 to 50 parts by mass, especially preferably 5 to 40 parts by mass with respect to a total of 100 parts by mass of the acrylic resin (d) and the fatty polyester resin (b), from the viewpoints of the photoelastic coefficient, strength, heat resistance and Hayes value. When the amount is 50 parts by mass or less, the Hayes value under atmosphere with high humidity and heat favorably lowers. Optical material with a small Hayes value, or small Hayes value change can preferably be used for the display application. In the present invention, the thickness of the protective film is preferably 0.1 µm or more from a viewpoint of a handling property, and preferably 300 m or less from a viewpoint of requirement of miniaturization in the technical field. Then, for a similar reason, a range of 0.2 to 250 m is further preferable, and a range of 0.3 to 200 m is especially preferable. To laminate the polarization film onto the protective film, it is preferable to use an adhesive with optical isotropy, and examples of such an adhesive include a polyvinyl alcohol adhesive, a urethane adhesive, an epoxy adhesive and an acrylic adhesive. When an adherence property between the polarization film and the protective film is poor, the protective film can be appropriately subjected to a surface treatment such as a corona treatment, a primer treatment or a coating treatment prior to a lamination with the polarization film in order to improve its adherence property. When the protective film using the molded article for the optical element of the present invention is used in one surface of the polarizer and the protective film consisting of the acrylic resin (d) is used in the other surface, disadvantages such as warpage or curl due to a characteristic difference between the resins and abnormality due to stress caused by a difference in moisture absorption are reduced. There is no special limitation on the polarization film for use in such a polarizer. However, for example, a preferred polarization film is an uniaxially drawn resin film which absorbs and orients a dichroic dyestuff. Such a polarization film can be manufactured using a known method, and manufactured by a method disclosed in, for example, Japanese Patent Application Laid-Open No. 2002-174729 . An example of the method is described as follows. A resin constituting the polarization film is preferably a polyvinyl alcohol resin, and the polyvinyl alcohol resin is preferably obtained by saponifying a polyvinyl acetate resin. Here, in addition to polyvinyl acetate which is a homopolymer of vinyl acetate, examples of the polyvinyl acetate resin include a copolymer of vinyl acetate and another monomer copolymerizable with vinyl acetate. Examples of the other monomer to be copolymerized with vinyl acetate include unsaturated carboxylic acids, olefins, vinyl ethers, and unsaturated sulfonic acids. Moreover, a degree of saponification of the polyvinyl alcohol resin is preferably 85 to 100 mol%, more preferably 98 to 100 mol%. This polyvinyl alcohol resin may further be modified. For example, poly(vinyl formal) or polyvinyl acetal modified with aldehyde or the like may be used. A degree of polymerization of the polyvinyl alcohol resin is preferably 1000 to 10000, more preferably 1500 to 10000. The polarization film can be manufactured through, for example, preparing a film from a resin, drawing the film uniaxially, dyeing the drawnpolyvinyl alcohol resin film with the dichroic dyestuff to adsorb iodine or dichroic dye, treating the polyvinyl alcohol resin film which has adsorbed the dichroic dyestuff with an aqueous boric acid solution, and water-washing the film after the treatment with the aqueous boric acid solution. The uniaxial drawing may be carried out before the dyeing with the dichroic dyestuff, simultaneously with the dyeing with the dichroic dyestuff, or after the dyeing with the dichroic dyestuff. When the uniaxial drawing is carried out after the dyeing with the dichroic dyestuff, the uniaxial drawing may be carried out before the boric acid treatment or during the boric acid treatment. Moreover, the uniaxial drawing may be carried out in a plurality of stages. To carry out the uniaxial drawing, the film may uniaxially be drawn between rolls having different peripheral speeds, or may uniaxially be drawn using a heat roll. Dry drawing carried out in the atmosphere can be employed, or wet drawing carried out for the film wetted with a solvent can be employed. The draw ratio is generally about four to eight times. To dye the resin film with the dichroic dyestuff, for example, the resin film may be immersed into an aqueous solution containing the dichroic dyestuff. Examples of the dichroic dyestuff include iodine and the dichroic dye. When iodine is used as the dichroic dyestuff, it is possible to employ a method for immersing the resin film into an aqueous solution containing iodine and potassium iodide to dye the film. A content of iodine in this aqueous solution is preferably about 0.01 to 0.5 parts by mass per 100 parts by mass of water, and a content of potassium iodide is preferably about 0.1 to 10 parts by mass per 100 parts by mass of water. A temperature of this aqueous solution is preferably about 20 to 40 deg. C, and an immersion time into this aqueous solution is preferably about 30 to 300 seconds. When the dichroic dye is used as the dichroic dyestuff, it is possible to employ a method for immersing the polyvinyl alcohol resin film into an aqueous solution containing the dichroic dye to dye the film. A content of the dichroic dye in this aqueous solution is preferably about 1 × 10-3 to 1 × 10-2 parts by mass per 100 parts by mass of water. This aqueous solution may contain inorganic salt such as sodium sulfate. A temperature of this aqueous solution is preferably about 20 to 80 deg. C, and an immersion time into this aqueous solution is preferably about 30 to 300 seconds. After dyeing the film with the dichroic dyestuff, the boric acid treatment is carried out by immersing the dyed resin film into an aqueous boric acid solution. A content of boric acid in the aqueous boric acid solution is preferably about 2 to 15 parts by mass, further preferably 5 to 12 parts by mass with respect to 100 parts by mass of water. When iodine is used as the dichroic dyestuff, this aqueous boric acid solution preferably contains potassium iodide. A content of potassium iodide in the aqueous boric acid solution is preferably about 2 to 20 parts by mass, more preferably 5 to 15 parts by mass with respect to 100 parts by mass of water. An immersion time into the aqueous boric acid solution is preferably about 100 to 1200 seconds, more preferably about 150 to 600 seconds, further preferably about 200 to 400 seconds. A temperature of the aqueous boric acid solution is preferably 50 deg. C or more, more preferably 50 to 85 deg. C.
After boric acid treatment, the resin film is preferably subjected to a water washing treatment. The water washing treatment is carried out by, for example, immersing the boric acid -treated polyvinyl alcohol resin film into water. After water washing treatment, the film is appropriately subjected to a drying treatment to obtain the polarization film. A temperature of water in the water washing treatment is preferably about 5 to 40 deg. C, and an immersion time is preferably about 2 to 120 seconds. A subsequent drying treatment is preferably carried out using a hot air drier or a far infrared heater. A drying temperature is preferably 40 to 100 deg. C. A treatment time in the drying treatment is preferably about 120 seconds to 600 seconds. From viewpoints of handling easiness of the film and demand for a thinner display, the final film thickness is preferably 5 to 200 m, further preferably 10 to 150 m, especially preferably 15 to 100 m.
Next, the present invention will specifically be described in the following examples, An evaluation method used in the present invention and the examples will be described. A birefringence measurement device described in detail in Macromolecles 2004, 37, 1062 - 1066 is used. A tension device for a film is placed in a path of laser light. The birefringence of a test piece of a resin composition with a width of 7 mm is measured at 23 deg. C, while a tensile stress is applied to the piece. A strain rate during stretching is set to 20%/minute (a length between chucks: 30 mm, a chuck movement speed: 6 mm/minute). Values measured in this way are plotted as coordinates with a y-axis indicating a birefringence (n) and an x-axis indicating a stretch stress (R). The gradient of the initial straight portion of the plots, and the photoelastic coefficient (CR), is determined by least square approximation. The smaller the absolute value of the gradient is, the closer to zero the photoelastic coefficient is, and this indicates that a preferable optical characteristic is provided. npr-nvt of a resin at 23 deg. C is measured after having drawn the test piece by applying a tensile stress under a temperature of glass transition temperature to glass transition temperature+50 deg. C and having quenched and hardened the drawn test piece npr-nvt a 23 deg. C is measured. If npr-nvt is negative, it is determined that the inherent birefringence is negative. If npr-nvt is positive, it is determined that the inherent birefringence is positive. Measurement is carried out in accordance with ASTM D1003. A mass-average molecular weight is measured at 40 deg. C using GPC (GPC-8020 manufactured by Tosoh Corp., detection RI, Column Shodex K-805 manufactured by SHOWA DENKO K.K., 801 connection), and using chloroform as a solvent at a measurement temperature of 40(C based on the standard of in terms of commercial standard polystyrene. A thickness d (nm) of a film is measured using a thickness gauge. This value is input into a birefringence measurement device RETS-100 manufactured by Otsuka Electronics Co., Ltd., a sample is arranged so that a measurement surface is perpendicular to measurement light, and the in-plane retardation (Re) at 23 deg. C is measured and calculated by a rotating analyzer process. The average index of refraction n of an optical film is measured at 23 deg. C by use of a laser refractometer Model 2010 manufactured by Metricon Co. Then, the average index of refraction n and the film thickness d (nm) are input into the birefringence measurement device RETS-100 manufactured by Otsuka Electronics Co., Ltd., and the thickness-direction retardation (Rth) and the Nz coefficient at 23 deg. C are measured and calculated. A spectrum is measured using U-331 0 manufactured by Hitachi Ltd. to obtain a transmittance in 380 nm. A film with a size of 200 mmx200 mm squares cut out from a polarizer is arranged on a horizontal flat base so that the center of the film comes in contact with the base, and is left to stand at 23 deg. C under an atmosphere of 50% RH for 72 hours, and the average height of the warpage of the four corners of the cut film from the base is calculated. wherein H2 is a value (parallel transmittance) measured using a spectrophotometer in a state where two polarizers are superimposed on each other so that orientation directions of the plates are the same, and H1 is a value (orthogonal transmittance) measured in a state where two polarizers are superimposed on each other so that the orientation directions are perpendicular to each other. The polarization degree is measured using a spectrophotometer UV-3150 manufactured by Shimadzu Seisakusho Ltd. The polarization degree retention ratio is a numeric value obtained by dividing the polarization degree after a retention test under conditions of 60 deg. C and 90%RH for 1000 hours by the polarization degree before the test, and multiplying the resultant value by 100. The larger the numeric value is, the higher the durability is. A monomer mixture including 72 % by mass of styrene, 13 % by mass of acrylonitrile and 15 % by mass of ethyl benzene was continuously supplied into a complete mixture type reactor with a stirrer, and a polymerization reaction was carried out at 150 deg. C for a retention time of two hours. The resultant polymerization solution was continuously supplied to an extruder, an unreacted monomer and solvent were separated and collected in the extruder, and pellets of the styrene-acrylonitrile copolymer (a-1) were obtained. The resultant styrene-acrylonitrile copolymer (a-1) was clear and colorless. As a result of composition analysis by neutralization titration, a content of styrene was determined to be 80 % by mass, and a content of acrylonitrile was determined to be 20 % by mass. A melt flow rate value measured at 220 deg. C with a load of 10 kg in accordance with ASTM-D1238 was 13 g/10 minutes. A photoelastic coefficient of the copolymer (undrawn state) was 5.0 × 10-12 Pa-1, and an inherent birefringence thereof was negative. Continuous solution polymerization was carried out using a device entirely made of stainless steel. A solution including 75.2 % by mass of styrene, 4.8 % by mass of methacrylic acid and 20 % by mass of ethyl benzene was prepared, and 1,1-tert-butylperoxy-3,3,5-trimethyl cyclohexane was used as a polymerization initiator. This prepared solution was continuously supplied at a speed of 1 L/hr. to a complete mixture type polymerization reactor with a stirrer having an inner volume of 2 L, and polymerization reaction was carried out at 136 deg. C.
The polymerized solution containing 49% of solid content was continuously taken out, first preheated to 230 deg. C, kept at 230 deg. C, supplied to a devolatilizer having an internal pressure reduced to 20 torr, and continuously discharged with a gear pump of a lower part of the devolatilizer after elapse of an average retention time of 0.3 hour. The resultant styrene-methacrylic acid copolymer (a-2) was colorless and clear, and as a result of composition analysis by neutralization titration, a styrene content was determined to be 92 % by mass, and a methacrylic acid content was determined to be 8 % by mass. A melt flow rate value measured at 230 deg. C with a load of 3.8 kg in accordance with ASTM-D1238 was 5.2 g/10 minutes. A photoelastic coefficient of the copolymer (undrawn) was 4.8 × 10-12 Pa-1, and an inherent birefringence thereof was negative. On the other hand, maleic anhydride heated to 70 deg. C was supplied as a second prepared solution to the same polymerization reactor at a speed of 0.10 kg/hr, and polymerization was carried out at 111deg. C. When a polymerization conversion ratio reached to 54%, the polymerized solution was continuously taken out from the polymerization reactor, first preheated to 230 deg. C, kept at 230 deg. C, supplied to a devolatilizer having a internal pressure reduced to 20 torr, and continuously discharged with a gear pump of a lower part of the devolatilizer after elapse of an average retention time of 0.3 hour to obtain a styrene-maleic anhydride copolymer (a-3). The resultant styrene-maleic anhydride copolymer (a-3) was colorless and clear. As a result of composition analysis by neutralization titration, a content of styrene was determined to be 85 % by mass, and a content of maleic anhydride unit was determined to be 15 % by mass, and a melt flow rate value measured at 230 deg. C with a load of 2.16 kg in accordance with ASTM-D1238 was 2.0 g/10 minutes. A photoelastic coefficient of the copolymer (undrawn state) was 4,1 × 10-12 Pa-1, and an inherent birefringence thereof was negative. To a monomer mixture including 89.2 parts by mass of methyl methacrylate, 5.8 parts by mass of methyl acrylate and 5 parts by mass of xylene, 0.0294 part by mass of 1,1-di-t-butylperoxy-3,3,5-trimethyl cyclohexane and 0.115 part by mass of n-octylmercaptan were added and uniformly mixed. The solution was continuously supplied to a sealed type pressure resistant reactor having an inner volume of 10 L. Polymerization reaction is carried out at an average temperature of 130 deg. C for an average retention time of two hours while stirring, and then the reaction solution was continuously transferred to a storage tank with a deaeration equipment connected to the reactor to remove volatile portions therefrom. The melted solution was further continuously transferred to an extruder to obtain pellets of a (methyl methacrylate-methyl acrylate) (b-1) copolymer. The resultant methyl methacrylate-methyl acrylate copolymer (b-1) had a methyl acrylate content of 6.0 % by mass and a mass-average molecular weight of 145,000, and a melt flow rate value measured at 230 deg. C with a load of 3.8 kg in accordance with ASTM-D1238 was 1.0 g/10 minutes. A photoelastic coefficient of the copolymer (undrawn state) was "42 × 10-12 Pa-1, and an inherent birefringence was negative. To a monomer mixture including 93.2 parts by mass of methyl methacrylate, 2.3 parts by mass of methyl acrylate and 3.3 parts by mass of xylene, 0.03 part by mass of 1,1-di-t-butylperoxy-3,3,5-trimethyl cyclohexane and 0.12 part by mass of n-octylmercaptan were added and uniformly mixed. The solution was continuously supplied to a sealed type pressure resistant reactor having an inner volume of 10 L. Polymerization reaction is carried out at an average temperature of 130 deg. C for an average retention time of two hours while stirring, and then the reaction solution was continuously sent to a storage tank connected to the reactor to remove volatile portions therefrom under constant conditions. The melted solution was further continuously transferred to an extruder to obtain pellets of a methyl methacrylate-methyl acrylate copolymer (b-2). The resultant methyl methacrylate-methyl acrylate copolymer (b-2) had a methyl acrylate content of 2.0% and a mass-average molecular weight of 102,000, and a melt flow rate value measured at 230 deg. C with a load of 3.8 kg in accordance with ASTM-D1238 was 2.0 g/10 minutes. A photoelastic coefficient of the copolymer (undrawn state) was -4.4 × 10-12 Pa-1, and an inherent birefringence was negative. A benzotriazole compound (c-1) (ADEKASTAB LA-31 (melting point (Tm):195 deg. C) manufactured by ADEKA Corporation) was used. A mass decrease ratio in heating from 23 deg. C to 260 deg. C at a rate of 20 deg. C/min. was measured using ThermoPlus TG8120 manufactured by Rigaku Denki K.K., and determined to be 0.03%. As a comparative example, polycarbonate (WONDERLITE PC-110 manufactured by Asahi Kasei Corporation) was used. A photoelastic coefficient of polycarbonate (undrawn state) was 70× 10-12 Pa-1, and an inherent birefringence thereof was positive. The above-mentioned methyl methacrylate-methyl acrylate copolymer (b-1) was used as a methyl methacrylate/methyl acrylate copolymer (d-1). A methyl methacrylate-maleic anhydride-styrene copolymer was obtained by a method disclosed in Japanese Patent Publication No. 63-1964 . The resultant methyl methacrylate-maleic anhydride-styrene copolymer (d-2) had a composition of 74 % by mass of methyl methacrylate, 10 % by mass of maleic anhydride and 16 % by mass of styrene, and a copolymer melt flow rate value (ASTM-D1238; 230 deg. C, a load of 3.8 kg) was 1.6 g/10 minutes. Polylactic acid (e-1) (4032D manufactured by Cargilldow Co.) was used. Resin compositions with blend ratios described in Table 1 were extruded to obtain undrawn films by using an extruder (KZW15TW-25MG-NH type/provided with a T-die having a width of 150 mm/a lip with a thickness of 0.5 mm) provided with the T-die and manufactured by Techno Bell Co., while adjusting a screw rotation number, a temperature of the resin in a cylinder of the extruder and a temperature of the T-die =. A composition, extrusion molding conditions, a film thickness and a photoelastic coefficient of each undrawn film are shown in Table 1. For comparison, the photoelastic coefficient of a commercial triacetyl cellulose (TAC) film (LOFO manufactured by High Tech Film Co., trade name TACPHAN, having a positive photoelastic coefficient and a positive inherent birefringence) is shown as Comparative Example 4. Any of undrawn films (Examples 1, 3 to 5) of the present invention had a small absolute value of the photoelastic coefficient and high transparency. In contrast, an undrawn film (Comparative Example 3) obtained from polycarbonate conventionally used as a retarder film and a TAC film conventionally used as a protective film of a polarizer had a very large absolute value of the photoelastic coefficient. Moreover, films (Comparative Examples 1, 2, 9, 12) in which resins (a) and (b) were used singly had a large absolute value of the photoelastic coefficient as compared with Examples 1, 3 to 5. Resin compositions were extruded to obtain undrawn films by using an extruder (KZW15TW-25MG-NH type/provided with a T-die having a width of 150 mm/a lip with a thickness of 0.5 mm) provided with a T-die and manufactured by Techno Bell Co., while adjusting a screw rotation number, a temperature of the resin in a cylinder of the extruder and a temperature of the T-die. A direction of flow of the film (an extruding direction) was defined as MD direction, and a direction perpendicular to the MD direction was defined as TD direction. Subsequently, films with a width of 50 mm cut out from the resin undrawn films were uniaxially drawn (a length between chucks: 50 mm, a chuck movement speed: 500 mm/minute) using a tension tester to obtain uniaxially drawn films of Example 2 and Comparative Examples 5 to 7. A composition, extrusion molding conditions, drawing conditions and film characteristics of each uniaxially drawn film are shown in Table 2. For comparison, a photoelastic coefficient of a commercial triacetyl cellulose (TAC) film (LOFO manufactured by High Tech Film Co., trade name TACPHAN, having a photoelastic coefficient of 10 × 10-12 Pa-1 and a positive inherent birefringence) is shown as Comparative Example 4. The uniaxially drawn film (Example 2) of the present invention had a small absolute value of the photoelastic coefficient, while uniaxially drawn films of comparative examples (Comparative Examples 5 and 6) had large absolute values of the photoelastic coefficient. Additionally, the uniaxially drawn film (Example 2) had a large birefringence sufficient for use as a retarder film, and had a negative value of Rth. Resin compositions having compositions described in Table 3 were extruded to obtain undrawn films by using an extruder (BT-30-C-36-L type/provided with a T-die having a width of 400 mm/a lip with a thickness of 0.8 mm) provided with a T-die and manufactured by PLABOR Co. Ltd., while adjusting a screw rotation number, an resin temperature in cylinder of the extruder and a temperature of the T-die. The undrawn films were uniaxially drawn in a film flow direction (an extruding direction) (an MD direction) by use of a roll-type vertical drawing machine manufactured by Ichikin Kogyo K.K. Rotation speeds of two rolls (a low speed side roll/a high speed side roll) were adjusted so as to obtain a targeted set draw ratio, and the films were continuously drawn between the rolls. Subsequently, the resultant vertically uniaxially drawn films were continuously drawn in a direction (a TD direction) perpendicular to the MD direction by use of a tenter drawing machine manufactured by Ichikin Kogyo K.K. Drawings were carried out at a flow speed of 2 m/minute as adjusting a distance between tenter chucks in order to obtain a targeted draw ratio. A composition, extrusion molding conditions, drawing conditions and film characteristics of each film are shown in Table 3. Any of the films of Examples 6 to 25 had a small absolute value of a photoelastic coefficient and high all-wavelength light transmittance, and exhibited a high birefringence after having been drawn (Examples 7 to 17, 19 to 25). In contrast, the films of Comparative Examples 13 to 15 in which resins (a) or (b) were used singly had a large absolute value of the photoelastic coefficient as compared with the films of Examples 6 to 25 in which both of the resins were blended. Then, it could be confirmed from results of Examples 6 to 9, 12 to 14, 15 to 17, 18 and 19 that values of a film birefringence (nx-ny), Re and Rth can also be changed largely with drawing conditions. In consequence, it could be confirmed that in the present invention, Re and Rth could be controlled by adjusting the drawing conditions. Furthermore, it could be confirmed from comparison between Examples 20 to 22 and Examples 23 to 25 that ultraviolet rays could be blocked without largely influencing the photoelastic coefficient by adding an ultraviolet absorbent in an amount of as little as 1 part by mass with respect to a total of 100 parts by mass of the resins (a) and (b). Resin composition having compositions described in Table 4 were extruded to obtain undrawn films by using an extruder (BT-30-C-36-L type/provided with a T-die having a width of 400 mm/a lip with a thickness of 0.8 mm) provided with the T-die and manufactured by PLABOR Co. Ltd., while adjusting a screw rotation number, an resin temperature in cylinder of the extruder and a temperature of the T-die. Subsequently, films with a width of 1/2 of a distance between chucks cut out from the resultant undrawn film were uniaxially drawn in a direction (a TD direction) perpendicular to a film flow direction (an extruding direction) by use of a tenter drawing machine manufactured by Ichikin Kogyo K.K. Drawings were carried out at a flow speed of 2 m/minute as adjusting a distance between tenter chucks so as to obtain a targeted draw ratio. A composition, extrusion molding conditions, drawing conditions and film characteristics of each uniaxially drawn film are shown in Table 4. Any of the uniaxially drawn films of Examples 26 to 30 had a small absolute value of a photoelastic coefficient and an Nz value close to zero. Additionally, it could be confirmed from results of Examples 27 to 30 that the value of the photoelastic coefficient of the film increased as an amount of a resin (a) blended in the resin composition constituting the film increased. In consequence, it could be confirmed that in the present invention, the photoelastic coefficient of the resin composition can be controlled by adjusting the blending amounts of the resins (a) and (b). Resin compositions having compositions described in Table 5 were extruded and drawn in the same manner as in Examples 6 to 25, to manufacture polarizer protective films of Examples 31 to 34 and Teat Examples 1 to 3. 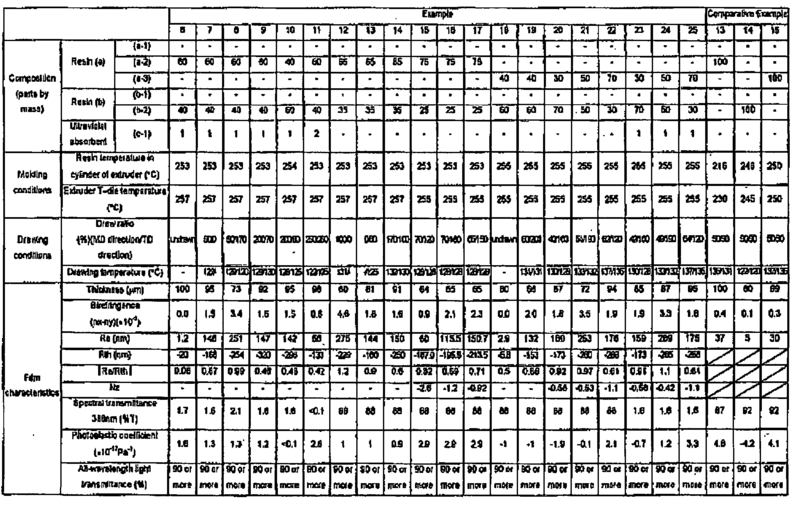 Molding and drawing conditions, film thicknesses and Re are shown in Table 5. A triacetyl cellulose film was manufactured as a typical example of a conventional polarizer protective film as follows. First, 21 parts by mass of triacetyl cellulose, 2 parts by mass of triphenyl phosphate (a plasticizer) and 1 part by mass of biphenyl diphenyl phosphate (a plasticizer) were dissolved in 62 parts by mass of methylene chloride, 12 parts by mass of methanol and 2 parts by mass of n-butanol, to prepare a dope. The dope was allowed to flow along an endless metal support to form a film on the support. The film on the support was dried until an amount of an organic solvent in the film became 60 % by mass, and the film was stripped from the support. A dimension of the film in a lateral direction was fixed using a tenter, and the film in this state was dried from both surfaces for three minutes until the amount of organic solvent in the film became 15 % by mass (primary drying). An elongation of a dimension of the film in a vertical direction was 4.5% from a time when the film was stripped from the support to a time when the primary drying of the film ended. Furthermore, the film was dried using a roller until the amount of the organic solvent in the film became 0.5 % by mass (secondary drying). The resultant film was wound up, and finally the surface of the film was subjected to a saponifying treatment to prepare a triacetyl cellulose film having a thickness of 80 m. An in-plane retardation of this film was 5 nm. A film of cycloolefin resin which was an amorphous polyolefin resin was manufactured as a typical example of a conventional polarizer protective film as follows. As cyclic polyolefin, ethylene and norbornene were subjected to additional polymerization to manufacture an ethylene-norbornene random copolymer (an ethylene content: 65 mol%, MFR: 31 g/10 minutes, a number-average molecular weight: 68000. The resultant resin 100 parts by mass was dissolved in a mixed solvent comprising 80 parts by mass of cyclohexane, 80 parts by mass of toluene and 80 parts by mass of xylene, and a film having a thickness of 80 m was prepared by a flow casting process. This film had an in-plane retardation of 6 nm. Polyvinyl acetate was saponified (a saponification degree of 98 mol%), and then molded, and the resultant polyvinyl alcohol film (a thickness of 75 m) was immersed in an aqueous solution comprising 1000 parts by mass of water, 7 parts by mass of iodine and 105 parts by mass of potassium iodide to adsorb iodine in the film. Subsequently, this film was uniaxially fivefold drawn in a vertical direction in 4 % by mass of aqueous boric acid solution at 40 deg. C, and then dried while being stretched to obtain a polarization film. By use of a 10% aqueous solution of a polyvinyl alcohol resin as adhesive, protective films of Examples 31 to 34 and Test Examples 1 to 3 were laminated on both surfaces of a polarization film in combinations shown in Table 6, to obtain polarizers. Warpages and polarization degree retention ratios of the polarizers of Examples 35 to 41 and Comparative Example 16 are shown in Table 6. It could be confirmed from Table 6 that the polarizer using the optical compensation film of the present invention as the protective film had little warpage and excellent durability against heat and humidity. In particular, the optical compensation film of the present invention can preferably be used in a polarizer protective film for use in an optical element required to have a high birefringence and a low photoelastic coefficient, for example, a liquid crystal display, a plasma display, an organic EL display, a field emission display, a rear protection television display a retarder film such as a 1/4 wavelength plate or a 1/2 wavelength plate; and a liquid crystal optical compensation film such as a view field angle control film. Above all, the optical compensation film of the present invention can preferably be used in an IPS mode liquid crystal display device retarder film required to have a negative value of thickness direction retardation. an acrylic resin (b) having a negative photoelastic coefficient and a negative inherent birefringence, wherein the value of the retardation in the thickness direction (Rth) is from -350 to -5 nm. The optical compensation film according to claim 1, wherein the acrylic resin (b) is a homopolymer of methyl methacrylate, or a copolymer of methyl methacrylate and another monomer which is at least one or more selected from the group consisting of alkyl ester of methacrylic acid other than the methyl methacrylate, alkyl ester or acrylic acid, aromatic vinyl compound, vinyl cyanide, maleimide, unsaturated carboxylic anhydride, and unsaturated acid. The optical compensation film according to claim 1, wherein the acrylic resin (b) is a copolymer of methyl methacylate and alkyl ester of acrylic acid. The optical compensation film according to claim 3, wherein the content of the alkyl ester of acrylic acid in the copolymer based on the total content of the monomers in the acrylic resin (b) is from 0.1 to 15% by mass. The optical compensation film according to claim 3, wherein the alkyl ester of acrylic acid is a methyl acrylate or ethyl acrylate. The optical compensation film according to claim 1, wherein the weight-average molecular weight of the acrylic resin (b) is from 50,000 to 200,000. The optical compensation film according to claim 1, wherein the acrylic resin (b) is obtainable by a bulk polymerization or a solution polymerization. The optical compensation film according to claim 1, wherein the acrylic resin (b) is obtainable by polymerization using a peroxide or an azobis initiator which is soluble in an organic solvent. The optical compensation film according to claim 1, wherein the acrylic resin (b) is obtainable by polymerization using an initiator within a range of from 0.005 to 5% by mass based on 100% by mass of a total monomers in the acrylic resin (b). The optical compensation film according to any one of claims 1 to 9, comprising 0.1 to 10 parts by mass of an ultraviolet absorbent (c) based on 100 parts by mass of the resin composition consisting of from 1 to 99 parts by mass of the acrylic resin (a) and 1 to 99 parts by mass of the resin (b). The optical compensation film according to claim 10, wherein the ultraviolet absorbent (b) is a benzotriazole compound or a benzotriazine compound. The optical compensation film according to any one of claims 1 to 11, wherein the mass ratio ((a)/(b)) of the content of the styrene resin (a) based on the content of the acrylic resin (b) is from 0.1/99.9 to 99.9/0.1. The optical compensation film according to any one of claims 1 to 12, wherein the absolute value of a photoelastic coefficient is within a range of from 0 to 4x10-12Pa-1. The optical compensation film according to any one of claims 1 to 13, wherein the absolute value of a photoelastic coefficient is from 0 to 4x10-12Pa-1, and a spectral transmittance in 380 nm is 5% or less. The optical compensation film according to any one of claims 1 to 14, which is a film or a sheet molded by extrusion molding. The optical compensation film according to any one of claims 1 to 14, which is a film or a sheet molded by cast molding. The optical compensation film according to any one of claims 1 to 16, wherein the absolute value of the ratio (Re/Rth) between the in-plane retardation (Re) and the retardation in the thickness direction (Rth) is 3 or less. The optical compensation film according to any one of claims 1 to 17, wherein the Nz coefficient is from -5 to 0. The optical compensation film according to any one of claims 1 to 18, wherein the thickness of the film is 1 µm or more but less than 300 µm. The optical compensation film according to any one of claims 1 to 19, wherein the total of the contents of the resins (a) and (b) is 70% by mass or more based on the resin composition. A polarizer protective film comprising the optical compensation film according to any one of claims 1 to 20. A polarizer having the protective film according to claim 21 with a Re of 10 nm or more laminated on one surface of a polarizing film, and a protective film made of an acrylic resin and with a Re of 10 nm or less laminated on the other surface of the polarization film. US735923A (en) * 1902-01-29 1903-08-11 Electric Sparking & Illuminating Company Sparking device for gas-engines.